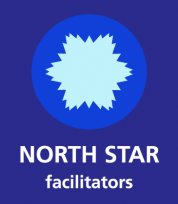 North Star Facilitators’ professional development workshops and training are for people who regularly need to use facilitation skills, want to become more collaborative in their leadership style and are called to work in culturally diverse situations. Professional development is different with North Star Facilitators. Many training and professional development programs are ineffective and changes are not retained for more than a few months. All too often, teams slide back into the same old patterns. North Star Facilitators uses scientifically proven learning methods targeted to each learning style. Our goal is for every participant to gain knowledge, skills and attitudes and retain those changes over time. We team up with our North Star associates to provide a wide variety of professional development workshops in the categories below. Many of our facilitator training courses are held in the the Portland, OR Metro area throughout the year. Check our Course tab for up-to-date information.